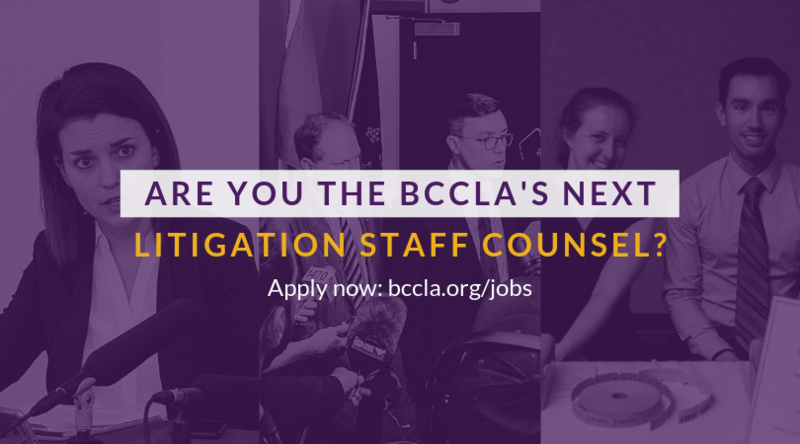 We're looking for a litigation lawyer who is passionate about using their legal skills to uphold civil liberties and human rights in Canada. The Litigation Staff Counsel will develop and litigate impact-driven cases on a wide range of issues at the trial and appellate levels of court. With a mandate that includes work on police accountability, government transparency, voting rights, prisoners’ rights, national security issues and more, we are one of the most vibrant and visible advocacy groups in Canada. Applications must be uploaded by April 21, 2019. The position will remain open until filled, but interviews may be conducted on a rolling basis so it is to your advantage to apply sooner rather than later! You can also help us find our next litigation counsel by circulating this position in your networks! Click here to share.